Have a mousetrap laying around but no mice to catch? Why not have some fun and turn it into a mousetrap catapult! Start by mounting the mousetrap on a piece of wood measuring 3 inches wide by 12 inches long. Use wood glue or bolts to mount the mousetrap. Cut two pieces of wood down to 2 inches wide and 4 inches long. Drill a 3/8" hole about 1/2" down from one end, along the center line of each piece of wood. Nail the two pieces of wood to the side of the base of the catapult, inline with the middle of the mousetrap. Cut a 3/8" dowel to 4 inches long. Insert it through the holes drilled in the previous step and glue it in place. 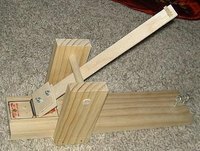 Create the arm of the catapult by cutting a piece of wood 1 inch wide and 8 inches long. Mount it onto the swinging "trap" part of the mousetrap with two 1.5 inch square pieces of wood, bolted together and sandwiching the catapult arm in place. Be sure that the arm is pulled back and "cocked" under the dowel before bolting in place. Screw the two screw eyes 1 inch apart at the end of the base. Adjust the height of the screw eyes so that a small dowel can be inserted and lock the arm down in the "cocked" position. Glue a small piece of wood, about 1 inch long and 1/4 inch wide at the end of the arm to keep the ammunition from sliding off the end of the arm. To fire the catapult, pull the arm down, load a piece of ammunition on the end of the arm, and release.